MV Swift Rescue is a Submarine Support and Rescue Vessel (SSRV) of the Singapore Navy. MV Swift Rescue and Deep Search and Rescue Six (DSAR 6) vessels provide a submarine rescue capability to the Singapore Navy. The MV Swift Rescue launches DSAR6 into water. 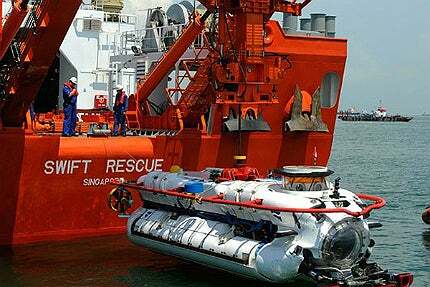 MV Swift Rescue is a Submarine Support and Rescue Vessel (SSRV) that is operated by the Singapore Navy. It was built by ST Marine, a subsidiary of Singapore Technologies Engineering (ST Engineering). The vessel is capable of conducting rescue operations in Sea State 5 conditions. Swift Rescue was launched by the Republic of Singapore Navy (RSN) in November 2008. The vessel is equipped with Submarine Escape and Rescue (SMER) capabilities. "Swift Rescue was launched by the Republic of Singapore Navy (RSN) in November 2008." The Republic of Singapore Navy (RSN) awarded a $400m Design, Build, Own and Operate (DBOO) contract to ST submarine, through a 20-year Public Private Partnership (PPP) scheme for a comprehensive ship and submarine rescue system and maintenance services, in January 2007. ST Marine formed a 50:50 joint venture with James Fisher Defence (JFD), in order to execute the project. The joint venture (JV) was named as First Response Marine Pte (FRM). JFD is a wholly-owned subsidiary of James Fisher and Sons. The rescue system includes a Submarine Rescue Vehicle (SRV) and a Submarine Support and Rescue Vessel (SSRV). The SRV is integrated with SSRV and will be transported to the distressed submarine location. ST Marine built the SSRV, while its JV partner JFD constructed the Deep Search and Rescue Six (DSAR 6) submersible rescue vessel. MV Swift Rescue was built at ST Marine’s Benoi yard. DSAR 6 was built on JFD’s Deep Search and Rescue (DSAR) 500 Class submarine rescue vehicle platform. The MV Swift Rescue vessel has a length of 85m, width of 18.3m and a design draught of 4.3m. The depth to main deck is 7.5m. It has a gross tonnage of 4,290t. The vessel can carry a crew of 27 members to carry out submarine escape and rescue operations. MV Swift Rescue is equipped with the Submarine Rescue Vehicle DSAR 6, a Transfer under Pressure (TUP) chamber, a Launch and Recovery System (LARS), an Integrated Navigation & Tracking System, a Remotely Operated Vehicle (ROV) and a helipad. The free-swimming submersible DSAR 6 SRV is operated by a two member crew. It can accommodate a maximum of 17 members. The SRV is launched and recovered by the LARS at the stern of the main deck up to Sea State 5. "The rescue system includes a Submarine Rescue Vehicle (SRV) and a Submarine Support and Rescue Vessel (SSRV)." The 9.6m long DSAR 6 submersible craft is capable of reaching a depth of 500m for the rescue of submariners. The Transfer under Pressure (TUP) chamber installed in the SSRV can hold a maximum of 40 members. It provides instant medical treatment and allows the transfer of rescued mariners from DSAR 6 to Swift Rescue. The ROV system aboard Swift Rescue will assist the crew to find and view the exact location of the distressed submarine (DISSUB) and clear the debris around the DISSUB. The MV Swift Rescue is mounted with a deck crane of 3t safe working load (SWL). The vessel has two 50-men enclosed life boats and a fast rescue boat. The helipad on Swift Rescue can support the operations of a single 12t helicopter. The embarked helicopter is used to transfer rescued mariners to land for providing better medical care. It also has a DP-2 dynamic positioning system. The onboard and underwater systems are monitored and tracked by an integrated navigation and tracking system. The accommodation facilities are provided for 85 personnel. Other facilities include a hospital with 18-single beds, and a mess. The power plant of Swift Rescue is equipped with two MAN 2040kW diesel engines, three Caterpillar 1,360kW diesel generators, two CPP Kort nozzle propellers and a 95kW emergency generator. The propulsion system also integrates two 1,000kW tunnel bow thrusters and two 420kW stern thrusters for high manoeuvrability. The vessel can cruise at a maximum speed of 12kt. It can be operated continuously without reaching dock for a period of about 28 days. The Archer Class is an upgrade of Västergötland Class diesel-electric submarines which were originally developed for the Swedish Navy. Victory Class missile corvettes are in service with the Republic of Singapore Navy (RSN).